This recipe is simply the classic Jollof Rice cooked with green vegetables. It's just a way to spice up the Jollof Rice dish. Other vegetables you can use: Ugu (Nigerian Pumpkin leaves), scent leaves or Green Amaranth. Other meats you can use: chicken, lamb, beef. When using chicken, skip crayfish and add thyme when seasoning the chicken. 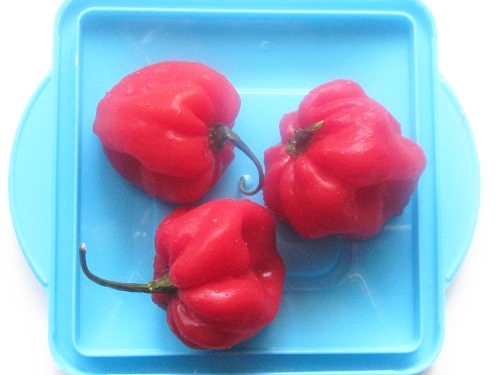 Habanero pepper is atarodo, atarugu or ose oyibo. 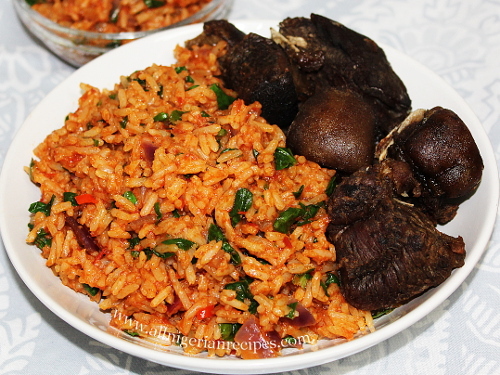 Parboil the rice using the method detailed in parboiling rice for cooking jollof rice. Rinse the parboiled rice with cool water and put in a sieve to drain. Wash and cut the leafy vegetables. Cook the goat meat with the stock cubes and half of the diced onions. When done, separate the goat meat from the goat meat stock and grill the meat in the oven. You can also deep-fry them. Pour the goat meat stock into a sizeable pot. Add the crayfish, some of the tomato stew and some salt. Stir, cover and start cooking on medium heat. 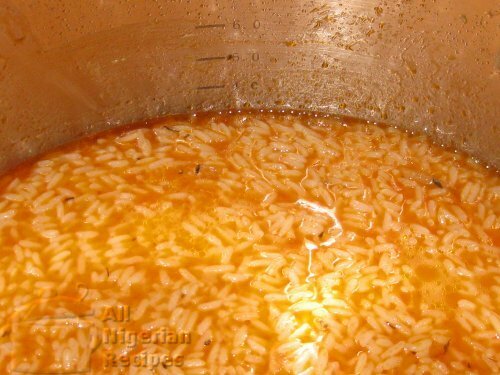 When it boils, add the drained parboiled rice and stir. The water level should be at the same level as the rice. This is to ensure that by the time all the water dries up, the rice will be done and there will be no need to add more water. You will need to parboil the rice correctly for this to happen. When you can no longer see the water (but the water is not yet dry), add the remaining onions and tomato stew. Cover and continue cooking till all the water dries up. If you parboiled the rice correctly, the rice should be done by the time the water is dry. Taste to confirm. If not, you will need to add more water and reduce the heat to prevent burning. Keep cooking till done. When dry, add the leafy vegetables, stir very well without squashing the rice and take it off the stove immediately. Serve with the grilled goat meat, Fried Plantains, Nigerian Moi Moi, Nigerian Salad or Coleslaw.